Today, I thought I would share one of my college projects from my Trend Forecasting class during my senior year in 2012. 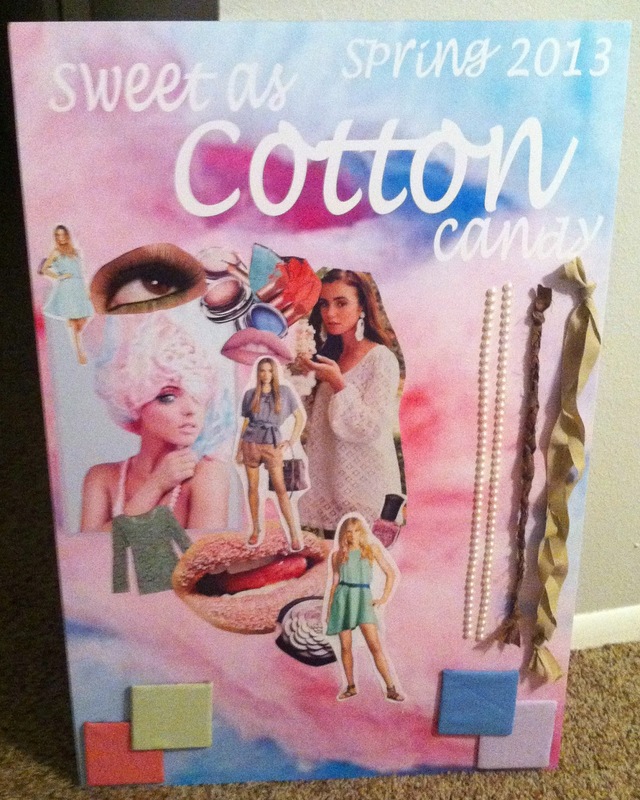 This was one of my favorite projects to do in fashion school. The idea is to create a mood board for an upcoming fashion season. Obviously, I chose Spring 2013. Students were asked to create a board projecting what we thought would be on trend during the season we chose. We had to base all of our ideas on once fabric choice. As you can see I chose cotton, and my prediction was that pastels would be on trend. I was totally right, by the way! (; Haha! This photo is poor quality, so it doesn't really pick up the colors as they actually were, but you get the idea of what a mood board is now, right? It's basically Pinterest or Polyvore on a foam board. I love creating mood boards and I don't do it often enough. I think there are a few things that I would change about this board now, but I can appreciate my college kid brain's work. I hope you enjoyed this little inside look at fashion school, as small as it may be. Maybe if I find more photos of my projects, I can make a mini-series out of this. PS-Please don't judge those braided scraps of fabric...I'm aware they're hideous. Haha! Woops!